Every performer has dreams of being able to share their craft with the greater masses. For many, that dream does not come true, but there are a select few who get to live that dream and one of those select few is award winning singer/songwriter (and fellow “Adaumbelle’s Quest” participant) Bobby Cronin. 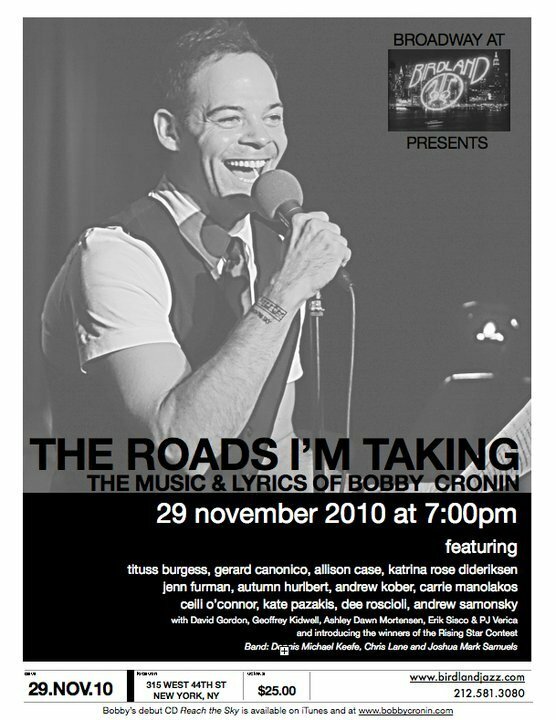 On Monday, November 29, I got to be in the audience as one of Bobby’s dreams came true when he got to perform “The Roads I’m Taking: The Musicals of Bobby Cronin” to a sold-out crowd at NYC’s famed jazz club Birdland as part of Jim Caruso’s “Broadway at Birdland” series. Jim doesn’tallow just anyone perform in his series, he always picks the creme of the crop, and Bobby Cronin is part of that crop! Performing selections from six of the musicals Bobby wrote the music and lyrics for, Bobby was joined on stage by a host of Broadway talent including fellow “Adaumbelle’s Quest” participants Tituss Burgess (Guys & Dolls, Little Mermaid), Kate Pazakis (Jerry Springer, South Pacific), Andrew Kober (Hair), Autumn Hurlbert (Legally Blonde), Jenn Furman (Wicked National Tour), Erik Sisco (Stonewall Sensation), as well as Andrew Samonsky (South Pacific), Dee Roscioli (Wicked), Gerard Canonico (American Idiot, Spring Awakening), Carrie Manolakos (Mamma Mia, Wicked), Katrina Rose Diderickson (Hairspray, Jerry Springer), Ceili O’Connor (UK Wizard Of Oz), Geoffrey Kidwell, Ashley Dawn Mortensen, PJ Verica, David Gordon, and the winners of “The Rising Star Contest” Emily Kay Shrader and David Tomczak. Bobby started the show off with “The Roads We’ve Taken” from “Daybreak” (books, music, & lyrics by Bobby Cronin), a 90-minute musical journey of family secrets, lost dreams, unexpected love, and forgiveness. Like Madonna, Bobby knows how to get the audience “Into The Groove.” “The Roads We’ve Taken” is a song about friendship and how all roads lead back to it. Kate Pazakis and Andrew Samonsky then took the stage to perform “Come Here Boy” and “8:01” from “Cryana” (book by Crystal Skillman, music & lyrics by Bobby Cronin) which is a modern twist on the Cyrano story. “Come Here Boy” is a song with a double meaning…Kate’s character is singing about trying to reel Andrew’s character in by giving him advice about how to get his dog to listen to him while Andrew’s character is trying to get his dog to listen. By the end of the song, both characters have a date together. Kate and Andrew have great chemistry together on stage and their vocals match wonderfully, both giving big powerful belts to express their emotion. As great as they are together, both performers are able to hold their own. “8:01” is sung by Andrew’s character alone as he is stood up by Kate’s character. Andrew communicates his emotions wonderfully using his vocal talents and really shined as he sung out! Keeping the energy going was Ceili O’Connor and Dee Roscioli performing two more songs from “Daybreak.” Ceili, who came over from London just for Bobby’s concert sang “A Girl’s Dream” all about a girl dreaming big and Dee sang “Move On” about a girl moving on to bigger and better things. Both performers gave a fine performance demonstrating their powerhouse vocals! Next up was Andrew Kober, Carrie Manolakos, Ashley Dawn Mortensen, and Geoffrey Kidwell performing songs from “‘Til Death Do Us Part” (book by Allen Mogol, music & lyrics by Bobby Cronin) about a small town minister on the rise, who meets Mary, the love of his life. Who could have imagined the ugly secrets so carefully hidden until murder intervened? All four performers sang “‘Til Death Do Us Part” about finding your true love until death. Together, they sounded great and separately, they held their own. Andrew then sang “Just Choose Right” which really allowed him to shine using his big booming voice as he sings about choosing “right” over “wrong.” Next, Carrie joined Andrew on “Perfect,” which mended their voices together perfectly, yet each performer still able to shine individually. The next two performers who took the stage were Emily Kay Shrader and David Tomczak, the winners of Bobby’s “The Rising Star Contest” where he asked performers who have never been on Broadway to submit a video of them performing one of his songs. Bobby had this contest because so many people have given Bobby a chance over the years, he wanted to return that favor to two people who had the same dream. With over 100 entries, Bobby and Brett Teresa narrowed down the winners to Emily & David. At a mere 18 years old, Emily has the powerhouse vocals of a seasoned performer while David just out of college, has the voice to match! Emily and David sang “Is This Love” from “A Christmas Carol” (by Angelyn Fullarton and Bobby Cronin) which is the classic Christmas story told through the eyes of five modern-day kids. It was evident these two were so excited to perform and to say they brought down the house is an understatement. The cheers and applause after they sang was evidence the crowd was dazzled and moved! The next show presented was “Welcome To My Life” (book by Alicia Dempster and Bobby Cronin, music & lyrics by Bobby Cronin) is a powerful, raw, and inspiring pop/rock musical about real issues faced by today’s teens. Bad-boy Cody is sent to a wilderness intervention program where he joins four painfully troubled teens who, with the tough-love of three counselors, embark on a journey toward finding self-worth and forgiveness. Gerard Canonico and Katrina Rose Dideriksen performed 2 songs each. Gerard sang “Run Away/Fine is All I’ve Got” chronicling Cody’s troubled past and current state and “Reach The Sky” a song of hope that one day he’ll make it. Gerard’s vocals are powerful and rough like a rock star which fits perfectly for these songs. Katrina sang “Wilted” about her character’s troubles and “Dear Daddy” a letter her character wrote to her deceased father. I was so moved by the vocal talent that came out of Katrina…she has everything I love in a performer from rich vocals to a soulful powerhouse belt! Following in their footsteps, were Autumn Hurlbert, Jenn Furman, Erik Sisco, and Geoffrey Kidwell who sang from “Ten Reasons I Won’t Go Home With You” (Book by Kelly Nichols and music & lyrics by Bobby Cronin, et al) for which Bobby, et al received the 2010 Midtown International Theatre Festival award for “Outstanding Music & Lyrics.” All four performers sang “Lucky In Love” about each of their hopes in finding love. Again, Bobby chose sings who’s vocals work well together, yet allows each one to shine on their own. After that Autumn and Jenn performed “You Deserve Better” a hilarious and true song about how their character’s deserve much better than the boys they’ve dated. Putting these two powerhouse vocalists together was a brilliant idea! Both Jenn and Autumn have powerful belts along with strong vocals and putting them together makes for quite an enjoyable time added to their comedic talents, makes them perfect for performing together, but yet as all the previous group songs, holding their own. Bobby must have known that saving this next performer and song for last was the way to make sure his show ended on a high note! Tituss Burgess took the stage (and the piano) to sing “The Best Is Yet To Come” from “Welcome To My Life” a positively hopeful song about holding on through the bad times because “The Best Is Yet To Come” (this song should not only become everyone’s personal anthem, but a national anthem as well). Tituss hit all the right notes so perfectly and beautifully, with such heart and soul, that the evening ended with a standing-ovation and cheering/applause that could have been heard throughout Times Square. I e-mailed Bobby right away telling him this song with Tituss singing it needs to be recorded as a single!